The Bible is a unique book full of inspiration, wisdom and practical answers. But it doesn't claim to be an easy book. It can be intimidating and overwhelming on first glance. These Bible Study Guides are designed to help. Our authors search the Scriptures with you in mind, considering what practical answers you need to deal with the real challenges in your life today. We want these lessons to be relevant, engaging and life-changing—making your life better now, and giving you a real, solid hope for your future. These lessons are a work in progress, and we have dozens more in the works. Let us know any suggestions you have for future lessons or for improving these lessons. And let us know any way we can serve you better. Your input is important to us—you are important to God and to us! May God bless your study of His precious Bible! These Bible Study Guides are designed to be studied on the Internet, and you are welcome to print them out if you want. We do not plan to print or mail these lessons. 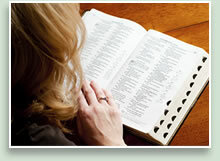 Preparing for Marriage: Before You Say "I Do"
Lesson 1: Is God Calling You? Lesson 2: What Is Faith? Lesson 4: Should You Be Baptized? Lesson 7: Eternal Life as God's Sons and Daughters! Lesson 7: Atonement: Satan Bound, Humanity Freed! These hands-on, introductory lessons cover practical issues that are relevant to your life now, and that give solid hope for your future. These lessons will give biblical answers to a wide variety of practical questions about how to live a Christian life in the modern world. Relationships, communications, finances, addictions and challenges of all types will be answered from the sure and practical wisdom of the Word of God. These lessons will deal with a variety of vital truths God has revealed in the Bible to benefit you. Understanding prophecy, the Ten Commandments, the benefits of having God's Spirit, the tools for spiritual growth, the spiritual armor of God and other fundamental teachings of the Bible will be covered. This series will look at God's master plan that offers human beings the opportunity for eternal life! We will look at it through the lens of God's festivals and Holy Days and their profound meaning. These often-neglected biblical festivals can help unlock what Jesus called the "mystery of the kingdom of God." God offers blessings now and a future beyond your wildest dreams! The Bible gives a road map of specific steps we should take in making that personal transformation. This series will look at the biblical answer to the question, "What must I do to be saved?" The Beyond Today Daily Video Blog is a way for you to connect with the presenters and start to build a lasting relationship with God. These videos will feature commentary about news, events and culture and how it all relates to you and the Kingdom of God. The Beyond Today program airs on ION Televison on Fridays at 8:30 a.m. Eastern & Pacific 7:30 a.m. Central & Mountain. To find a local cable ION channel in your area visit www.iontelevision.com . Click on "channel finder" on the top right of the webpage and enter your zip code. Then choose your cable provider to view which channel the ION Television Network is on.